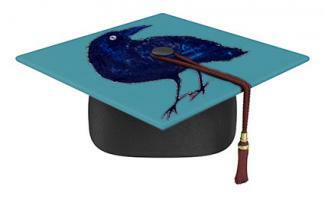 Decorative graduation caps are a trendy way for students to express themselves during one of life's major milestones. Whether you want to make a statement or just flash your sense of style, the main objective is just to have fun with it. 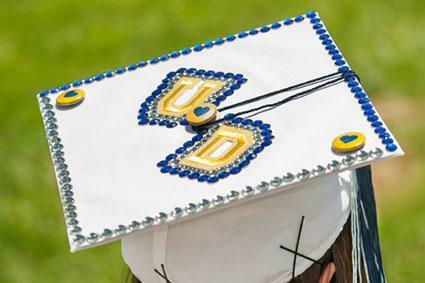 Make sure you check with your school's administration to see if cap decorations are allowed. If you're leaning toward a simple design on the mortarboard, your school colors make perfect sense. Most schools have two primary colors with accenting neutrals such as white, black, brown or metallic gold or silver. Your cap and gown is likely to be one of the neutral or primary colors associated with your school. A simple design using the other colors can be applied directly to the cap. Determine which side of the cap is the front and which side is the back. It will be marked inside the cap. Arrange your college logo and/or letter patches and buttons on the mortarboard without gluing anything down. Lay a jewel strip along one side of the mortarboard to determine if it needs to be trimmed or if you need more to to create a border. Once you are happy with the arrangement, apply a bead of hot glue to the back of each patch and glue them in place. Apply glue to the back of each button and glue them down, using one to cover the tassel button in the center of the cap. Apply a thin bead of glue along the edge of the mortarboard and attach the strip of jewels, even if they are self-adhesive to ensure they don't fall off. Use individual jewels to outline the logo and letter patches, giving them more of a finished appearance. Apply five or six small dabs of glue at a time, placing a jewel on each spot while the glue is still warm. Be careful not to burn your fingertips. Tip: If you decide to do a more intricate design and don't want to risk messing up your cap, make a paper cover out of card stock and decorate that before attaching it to the cap. If your graduation cap is black, it makes an excellent background for neon colored fabric puff paint. Since you can use the paint directly on the fabric of the cap, you should definitely have your design worked out on paper first. Choose designs that reflect your interests and personality, like music and peace signs, as well as your school mascot. You might also want to experiment with the puff paint a little bit on paper if you've never used it before. Use a small piece of white chalk or a white colored pencil to sketch the outline of your design lightly. Take care not to smudge any areas you've already worked on. Carefully go over the white lines with puff paint in the appropriate colors and fill in any areas that you wish. Allow the paint to dry for several days before using the cap. Tip: Once the paint is completely dry, you can glue on further embellishments such as rhinestones or a bow on the back. Note: The paper cap cover pictured was glued to the cap but easy modifications are included below so you can remove as needed. Place the cap upside down on the back of the card stock paper and trace the shape. Cut the square shape out. Lay the paper cover over the cap, ensuring all the sides are lined up. Lightly mark the location of the button on top, feeling for it with your fingertips. Draw a small circle with your pencil. Remove the paper and draw an X through the middle of the circle. Use a utility knife or scissors to cut the X. Arrange the lettering on the paper, dry fitting the words without attaching the letters until the entire message is spelled out and spaced to your liking. Reinforce the adhesive on the back of each letter with a dab of hot glue to ensure they don't fall off. Glue large acrylic jewels or strips along each edge of the paper for a bling border. Place the foam adhesive circles in all three corners at the sides and bottom on the back of the card stock cover. Leave the front corner empty and don't remove the liners covering the other sticky side of each foam circle just yet. Place the paper back over the cap and gently push the button through the X. Tuck the edges of the cut paper back up under the button to conceal the raw edge. Check to make sure your tassel cord still fits under the button. If it's too tight or you can't slide the tassel from one side to the other easily, carefully remove the paper and hook the tassel cord over the button before placing the paper back over the cap. Remove the liners on the other side of the adhesive foam circles and push the paper back over the button on the top of the cap, tucking the edges back up under the button. Press firmly in all three corners to secure the adhesive foam circles to the cap. The empty front corner will allow the tassel to move side to side during the ceremony. Tip: Add two or three foam adhesive circles to each corner to ensure the paper doesn't fall off. Use a small safety pin to attach a bow to the back of the cap if you like that look. Earning a degree is one of the biggest accomplishments you'll achieve in life and it's something to be proud of. 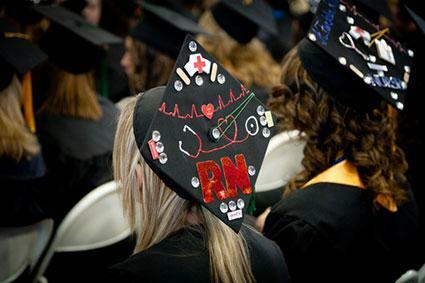 Decorate your graduation cap with iconic symbols of your career-in-waiting and display your abbreviated title with pride! 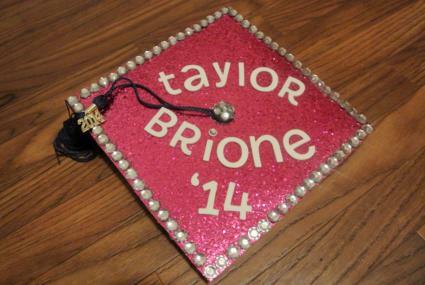 A mix of puffy fabric paint, 3D scrapbooking stickers, and a touch of bling makes a standout cap for a future nurse. Follow step 2 of the removable cap decoration idea (above) to make a button hole in the center of the card stock. Measure about halfway down from the tip of the front of the card stock, along both the left and right side and make a mark with your pencil. Draw a heart rate monitor design, starting at the left mark and curving slightly downward in the center. It should consist of short straight lines, small peaks and taller triangular peaks in the same order, with a consistent rhythm, like a heartbeat. The design should end at the mark you made on the right side. Use the red fabric paint (it works great on paper too) to go over your pencil lines. Be careful not to smudge the paint and allow it to dry when you're done. Add a little heart design in the very center of the monitor line with a button, scrap booking sticker, or more puffy paint. Draw the top part of the stethoscope about halfway between the buttonhole and the left corner of the card stock. The cord for the stethoscope should run about an inch under the buttonhole. The metal circle at the end can be drawn at a similar height and spacing as the top part, about halfway between the buttonhole and right corner of the card stock for a centered design. Or you can loop the cord in a heart-shaped design like the photo and extend the round metal end piece a little further out. Use the silver fabric paint to go over half of the ear piece arms of the stethoscope. Switch to red about halfway down each arm. Continue with the red until you get to the circle at the end. Use silver to outline the circle and place a silver dot in the center. Allow the paint dry. Center the letters for your nursing degree, such as LPN, RN, or BSN near the bottom of the paper and glue them in place. Fill in the empty corners with small medical-themed stickers and large rhinestones. Try different arrangements without gluing anything down until you're happy with the design. Then glue everything in place. Place the card stock cover over the mortarboard, pushing the button through the button hole. Tuck the edges of the cut paper back up under the button around the buttonhole. Run A bead of glue along the inside edge of each side of the paper and press the cover in place. Tip: Don't let the button in the middle of the cap deter you from a smoothly flowing design. Make it look like part of the design -- a deliberately placed rhinestone makes an easy fix. Whether your graduation ceremony is indoors or outside, making that diamond shaped mortarboard sparkle like one big jewel on your head is sure to get you noticed. So for this project, bring on the bling! Choose a color scheme for your dazzling bling cap such as varying shades of pink or purple or a metallic scheme in gold, silver, or copper. 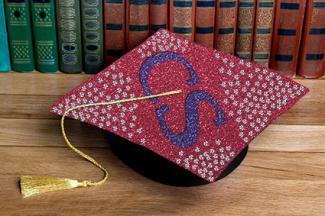 Use the mortarboard on your graduation cap as a template for cutting the glitter paper to the correct size. Follow step 2 of the idea for the removable cap (above) for making a hole for the button. Place the glitter paper on the cap and push the button through the hole you cut. Tuck the edges of the paper back up under the button. Run a line of glue along all four sides of the cap, about ¼ inch from the edge. Press the paper down to secure it. Arrange all of your lettering before you begin to glue it down. A phrase such as, "Shine Bright like a Diamond" is befitting of your bright future and dazzling cap. Another option for a college graduate could be "Celebrate with Bubbles" inspired by the drinking of champagne. The round jewels will resemble champagne bubbles if you pick out colors of amber and gold. You can also use your monogram or school letters for a quick and easy option. Starting in one corner, glue the acrylic jewels in the very tight cluster and work inward towards your wording or initials. One you reach the letters, move onto another corner, until all four are finished. Cluster them in the center of the cap, spacing them apart as you reach the outer edges. Cluster the jewels at the bottom part of the cap, spacing them out as you get higher, almost as if they "fade" as you work up the cap. Personalize your graduation cap with a stenciled image of your school mascot or a character you have idolized. A black and white drawing or photo works best as the outlined features will be painted in. 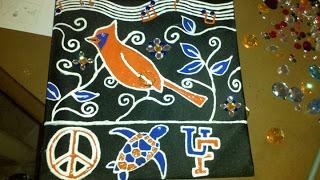 With acrylic craft paint, you can create the design directly on the fabric of the mortarboard. If you're worried about messing up, paint the design on a card stock cover before attaching it to the cap. Search online for pictures of your mascot or character that you can print out to use as a stencil. You may want to print out several sizes to find the best fit. Cut the character shape out and place it in the desired position on your cap. Use a piece of tape to hold it in place. Use the ballpoint pen to trace the outline of the character and its features. Go over your lines numerous times until the tip of the pen just breaks through the paper and leaves visible lines underneath. Carefully paint in the outlined features of the character. If using more than one paint color, allow the first color to dry before starting with another color. Once the painted design is dry, you can finish embellishing the cap with lettering, acrylic jewels, a bow, etc. 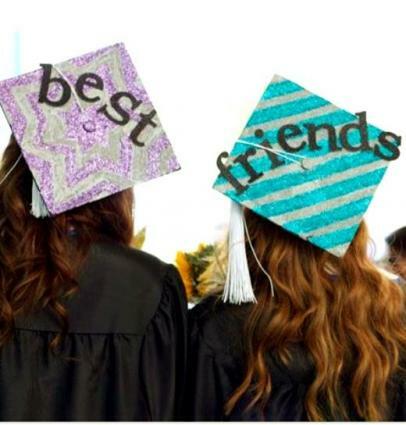 Show the special bond you have with your best friend or boyfriend by decorating your caps with similar materials, layout and color scheme. You could also connect caps with friends with each word of a phrase if you have assigned seats together, such as "We Did It!" or simple statement of "best friends." An easy geometric background in glitter paint provides a similar base for you and your "bestie." For the stripped pattern, place strips of painters tape going across the width of the card stock (oriented as it will be on your cap). Start in the bottom corner, leaving a small piece of the tip exposed. Space the next strip of tape half an inch above the first one and continue on to the top, leaving half an inch between each strip of tape. Apply the metallic silver or gold glitter paint in the empty white spaces. Brush in one to two coats, depending on your preference. Allow the paint to dry. Then carefully remove the painter's tape. Fill in the remaining white stripes with your chosen color of glitter paint. Use a small paintbrush or one with a flat, square head to keep your lines clean between colors. You can also use the straight edge of a plastic ruler as you paint along the line. For the star pattern, you may need one larger 6-point star template than the free printable page offers -- the largest star template is 8 inches. With a standard compass and a ruler, you can draw a 10 inch diameter circle to create a 10 inch star template. Follow these instructions to draw a 6-point star then cut the shape out. Print out additional 6-point star templates in 8-, 6-, and 4-inch sizes and cut them out. Place the 8-inch star template over the 10-inch one, lining the points up and trace around the shape. Cut the smaller shape out and you now have a large 6-point star stencil to attach to your card stock. Repeat the method with a 6- and 4-inch star to create a smaller 6-point star stencil. Position this stencil inside the larger one, making sure the points are lined up. Paint the remaining areas on the card stock not covered by the stencils in your chosen color of glitter paint. Allow the paint to dry and then carefully remove the stencils. Fill in the remaining star shapes with the metallic glitter paint, using the techniques in step 3 to ensure your lines stay crisp and sharp. Once the paint is dry, glue on the lettering for "best" on one cap cover and "friends" on the other cap cover. Glue the decorated card stock pieces to the mortar boards on the graduation caps. Once the hoopla of graduation is over, your decorated graduation cap is still worthy of displaying. Place it in a shadow box along with your diploma and any other memorable keepsakes from your college days and turn it into wall art.